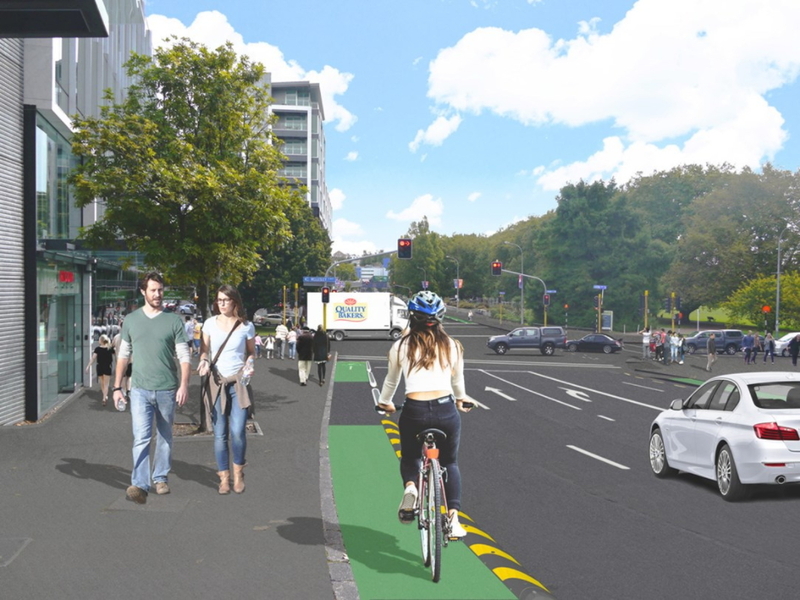 Last week, Auckland Transport launched consultation for the western section of the midtown cycleway as part of the Government’s Urban Cycleway Programme. It will run along Victoria St from Beaumont St through to Hobson St. Along the way it will link in the Nelson St cycleway and the under-construction Franklin Rd cycle lanes. In the future, it will also connect in to plans for cycle lanes on College Hill. In a marked difference from many of the cycleways that have been built in the city, this one features two single direction cycle lanes rather than the bi-directional lanes on routes like Nelson or Quay Streets. Also in the press release, AT say this, a shame they couldn’t say it with the midtown bus consultation. 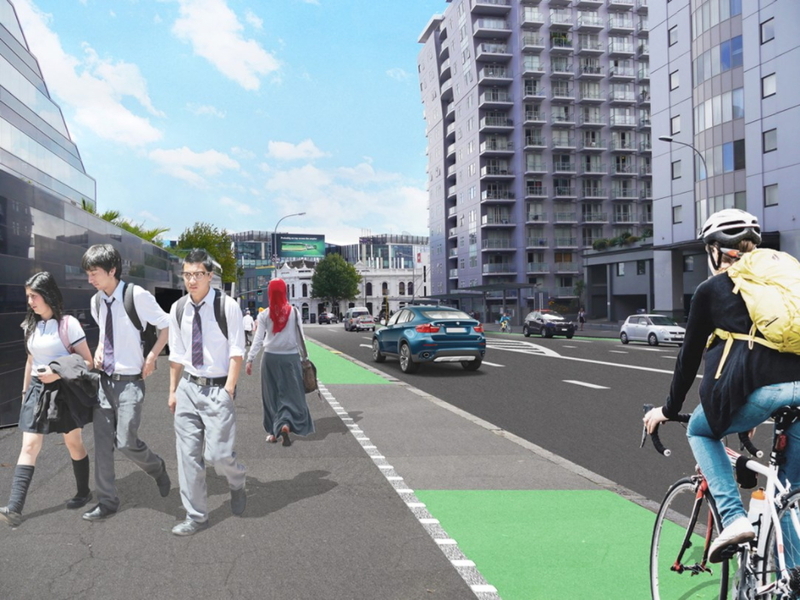 The planned cycle route will not prevent the construction of the Victoria St Linear Park as proposed. The route has been broken into a number of different sections, each with slightly different details depending on the conditions in that section. Here are some details on each of them moving West to East. Here are the plans for those interested in more detail. There are different outcomes for each side of the road. On the Northern side the cycleway is level is proposed to be a Copenhagen lane which means it would have a slightly different elevation to the road and the footpath. On the southern side the lane is buffered from the road with separators. Bus stops will share the cycleway so some care from cyclists will obviously be needed. The buffers on the south side are shown extending through the Beaumont St intersection. This intersection will undergo some positive changes with the removal of three of it’s slip lanes with only the Wellesley/Drake St lanes retained. This will help improve conditions for pedestrians too. As the eastbound cycle lane approaches the intersection, it too moves back to road level and gets some horizontal separation. Westbound things are fairly similar to the designs above wire the route is at road level separated with barriers. The only major difference is that due to the presence of a lot of driveways, there are fewer solid barriers and more mountable speed bumps, like can be seen in the image below approaching Halsey St. Eastbound sees a lot of variation between Halsey and Nelson St though. Mixing between being at the same level as the footpath to being at road level, and between being behind bus stops to next to the road. It would be interesting, if following the midtown bus consultation that AT remove buses from Victoria St – remember they were never meant to be on Victoria St anyway. I assume that would allow for more space for the cycleways and a more consistent design. On this section, the tables get reversed with the westbound section at footpath level while the eastbound section is at road level but with separators. Overall, while not perfect, this will be a useful addition to the city. Feedback is open till 5th June. Yet another part of the city centre’s transformation that has to be comprimised for AT’s spineless decision to put buses down Victoria Street. The team here have done a fantastic job for the most part to thread this through all of the obstacles in there. I can’t wait to see 3 or 4 cyclists heading into Wynyard Quarter using that hook turn box. 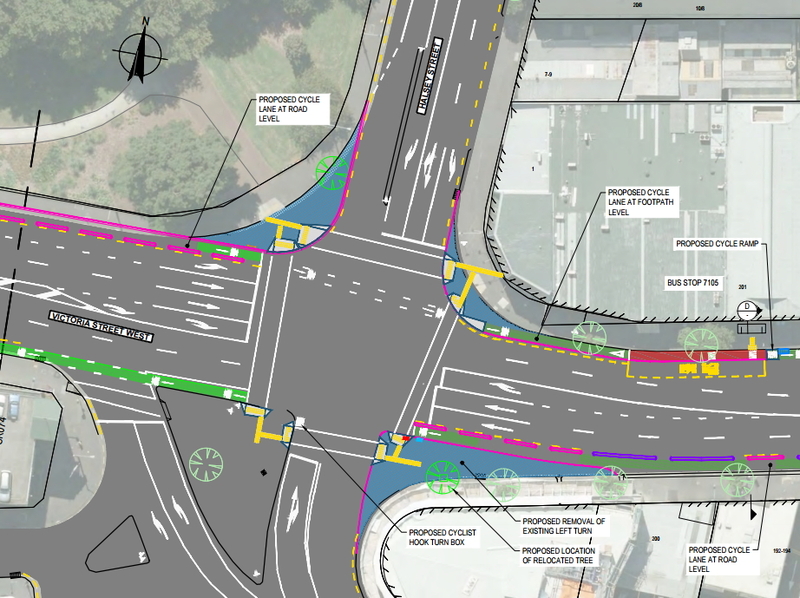 Overall it’s an improvement on previous designs, but there is still no appetite to design a real bicycle intersection. Am I missing something here? surely you can’t consult on the cycleway plans until the midtown bus route plans/linear park decision has been made (or as in the case of the linear park, hopefully, reaffirmed by council)? 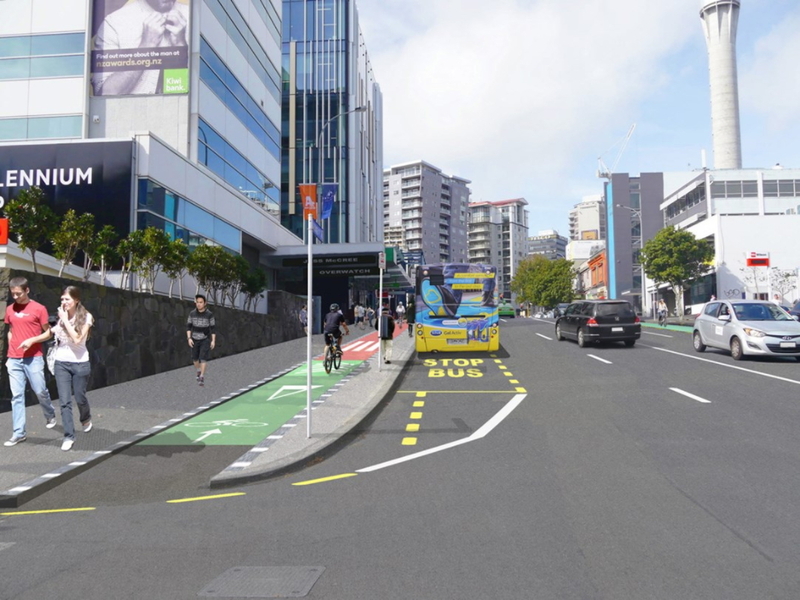 if buses don’t go down Victoria St, surely this means the cycleway will look a lot different? I think what you are missing is that AT lose the Urban Cycleways Funding if they haven’t at least awarded a contract by June 2018. If they don’t consult now then they can’t achieve that, even though there is a good chance they will have to completely tear this out when the linear park gets built. All because AT caved to UoA. Sailor Boy, is that date relevant for all the cycleways? I’m noticing a flawed consultation process which might be explained by this urgency. If anything will be better if buses taken out of Victoria St, so this is a yet another good piece in the big city puzzle. I wouldn’t be surprised if at some stage some of these earlier projects get rebuilt at whatever the current standard is, so I see this project as a step along the path. +1, can the moderators delete this? I’m liking the look of my future commute – SkyPath, Westhaven waterfront, cut across Victoria Park, Victoria St, Nelson St, and finish off up Te Ara I Whiti. I’d much prefer Victoria St. to be a linear park, but this will do in the meantime, until the CRL works are over. +1, that sounds like an awesome commute! Anyone got any update on Skypath? Any progress following the Downer pullout? 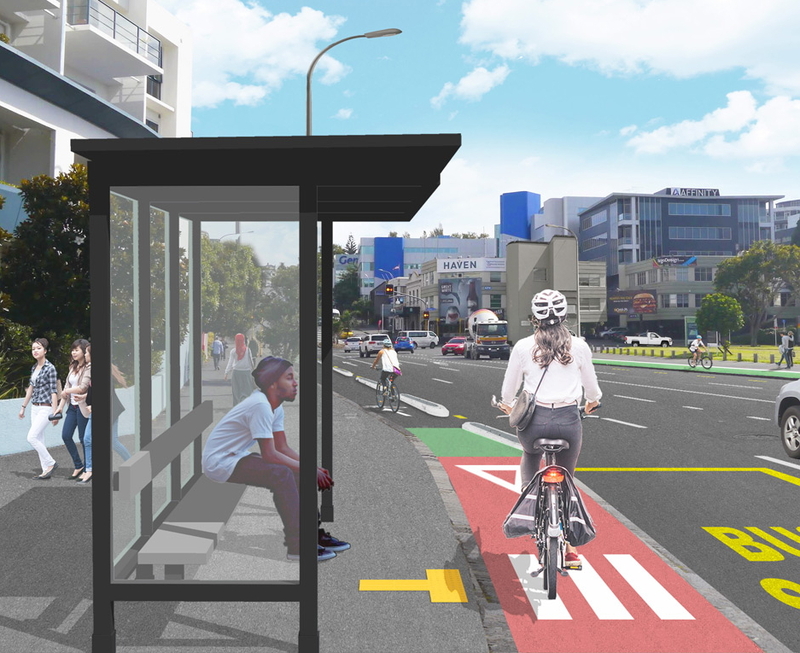 FWIW, Wellington’s Victoria Street has a bus stop / bike lane combo with a raised path giving way to bus passengers, as in the first westbound rendering above. I bike it daily, and it seems to work OK both for cycling and for getting on/off buses. The bus stop is not a particularly busy one though. The law is followed fairly well, and there’s some enforcement on the busier stops. there is another one like that at ngauranga, by the old lv martin store. What happens with traffic lights for vehicles wanting to turn left from Victoria St into Halsey St, while cyclists want to go straight ahead? Will there be a cyclist priority signal, or a left turn arrow? I’m quite pleased with much of this, and in my pedestrian shoes, especially with the elimination of the slip lanes. I cross here regularly with children, and cars often speed around the slip lanes, oblivious to the pedestrian crossings and to their responsibility to not run people down. My one suggestion for improvements is to increase the width of the ramps on the North side of Victoria St opposite the Franklin Rd intersection. 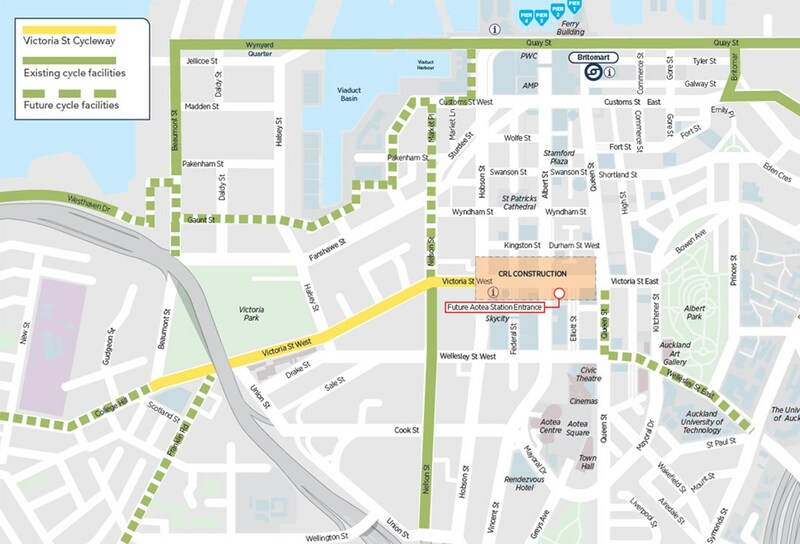 (see page 2 of https://at.govt.nz/media/1973491/victoria-street-cycleway-consultation-plans.pdf) Currently they are 1-2m wide. – right turn from Victoria St cycle lane heading east bound into Franklin Rd at the same time as the right arrow. – right turn out of Franklin Rd for people wanting to join the Victoria St cycle lane heading east. An initial look at this, with Vision Zero recommendations in mind, shows how far we still have to go. Well done to the AT Cycling and Walking Team who will have limits on what they’re allowed to do. Safe cycling requires proper separation between cars and bikes. and following the Vision Zero recommendations probably requires the removal of a lane of traffic in each direction. Nik’s comment above “I see this project as a step along” helps curb my impatience. Thanks for that. Shall they put a barrier with some plants? Doesn’t have to be very thick, a few inch barrier would do. Kelvin, yes. “In addition, where possible, we will retain trees and plant new ones to enhance the visual amenity of the area.” Jolly good. Looking forward to it. Where’s the green infrastructure to reduce the stormwater load, increase the water quality of our harbour, beautify the streetscape, reduce the urban heat effect, filter the air… and separate the cyclists from the traffic? The plans are not helpful for the bus user especial for the disabled. 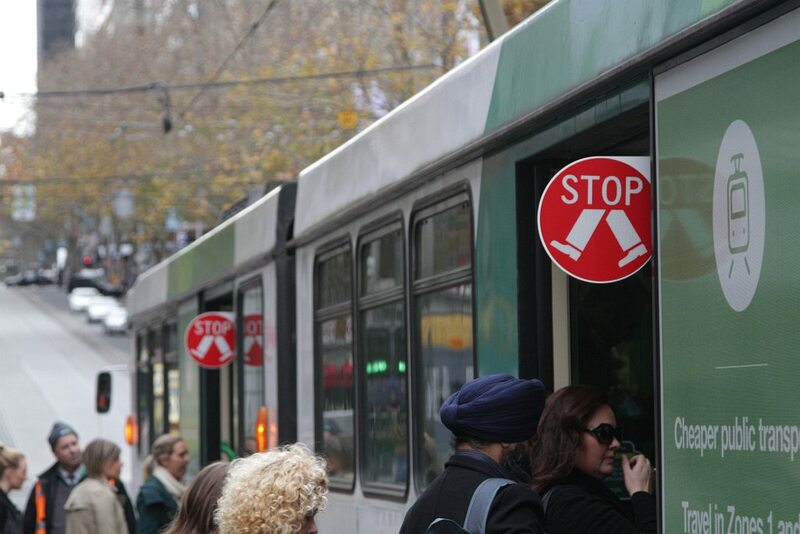 The first picture shows a lack of consideration for those needing help to board a bus. The ‘crossing’ is well behind the head of the bus stop. That the passenger has to step into the gutter to board the bus is not good especially when wet. Buses when they lower for a passenger assume the passenger is on the pavement not on the road. The Cycling team seem to have forgotten the Walking. I think you are misinterpreting the plans, at bus stops the cycle lanes rise up to footpath level. I know we’re all about preserving green spaces but wouldn’t it be justifiable to take just a little bit of land from Victoria Park to widen the footpath so there’s a separate path for pedestrians and cyclists? I know there will be (technically) separate paths in this proposed plan but all they’ve done is split the current path into two sections. Cyclists zipping to work are going to have slow right down for pedestrians walking to work with their headphones on and oblivious to everyone else. I think you are reading the plan wrong. This has the cycle lanes in the roadway, with physical separators. The cycle lanes come from narrowing up the traffic lanes a bit. All the footpath is still there. No, looking at the existing aerials, I think that part of the existing footpath is making up the Copenhagen cycleway on the north side of Victoria Park (it’s only separated dividers at the Halsey St end). But the Copenhagen cycleway will be at a different level to the footpath (and road), so I don’t think that cyclists will have to be quite so worried about oblivious pedestrians. It’s a bit of a worry that the separated cycleways are only 1.5-1.8m throughout the 900m lengths. How are you supposed to overtake a slower rider when you are confined on both sides? The only option seems to be to try to get a jump at the intersections. Having some sections at least 2.0-2.2m wide would help make these work better operationally. Yes, I don’t think there is the ability to overtake anyone. 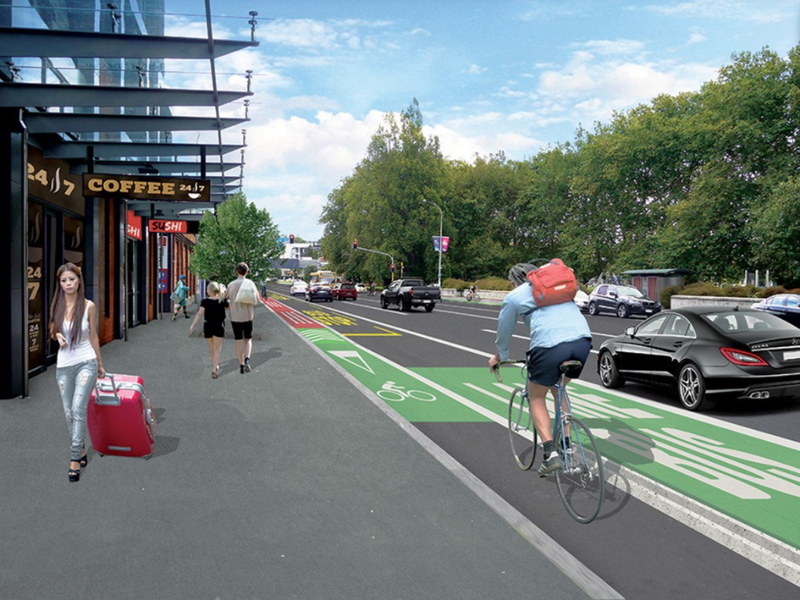 At least in this design, they have been more careful about the width of the separators – that width was missing in most of the Pt Chev to Waterview cycle way sections. I note the width only drops to 1.5m when the cycle lane is on the footpath side of the curb. If the cycle lane is on the road side of the curb, it is 1.7 or 1.8m. I might consider having older kids on such a cycleway, but only if we were able to slip onto the footpath as required to let a faster cyclist past, or if things got a little hairy. The little upstands shown (which presumably stop pedestrians from feeling like they could just spill onto the cycle lane) would need to have frequent, wide breaks to allow slipping onto the footpath like this. In some places, driveways would provide those breaks. In others, they’d have to design the breaks in. What do experienced commuter cyclists think about the widths, the upstands, the breaks I’ve proposed? Do you also need better ways to swap between cycle way and traffic lanes in order to avoid slow cyclists? I like Glen’s suggestion to have some sections wider, to allow for overtaking – would this be best at the intersections? Just after the intersections?